This week, Microsoft released version 2.1.24 of Outlook for Android phones, which includes several enhancements for Android Wear users. 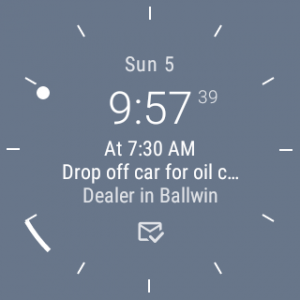 This release comes with an Outlook watch face for Android Wear watches. The watch face is configurable- it has 12 different background colors to choose from, as well as an option to choose for the accented text. The watch face will show you events, and their location, from your Outlook calendar which are occurring within the next 12 hours. The email icon shows you how many unread emails you have. If there are no calendar events coming up in the next 12 hours, the watch app shows you who has sent the unread emails. 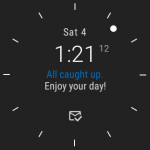 And of course you can easily view the email messages from the watch. If you have an Android Wear watch and use the Outlook app on your phone, the latest features are definitely worth checking out. Here is a short video which shows some of these new features in the Outlook for Android Wear update.